Reversible waves By Susan Harle - This casual accessory harbors two secrets! Increases and decreases turn the tubular peyote rope into a two-sided necklace. 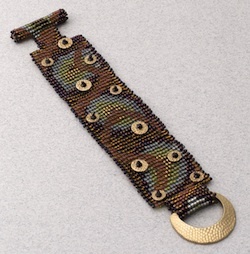 Meanwhile, round seed beads played against cylinders result in muti-color waves that stand out from solid-color stripes. Petticoat pearls necklace By Marina Nadke - Surround a pearl with ruffles of peyote stitch, make more in a rainbow of colors, and then wear them in a necklace. Super duper bracelet By Un-Roen Manarata - SuperDuo beads, bicone crystals, and pearls are the framework for this lovely bracelet. 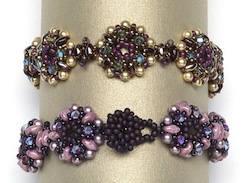 Create a spring garland to adorn your wrist using two-hole beads and classic Swarovski Elements. An adorable beaded button serves as the closure. Triangular opulence By Anu Rao - Create the look of fine jewelry with metallic triangle beads and glittering crystal drops. So often in bead weaving, the holes of our beads face away from the viewer. The unique orientation of the triangle beads in this necklace-and-earring set makes the most of the triangle shape and open up a whole other world of jewelry design. 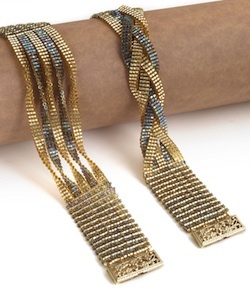 St. Pete squared By Jane Danley Cruz - Two layers of St. Petersburg chain give this necklace an organic texture. 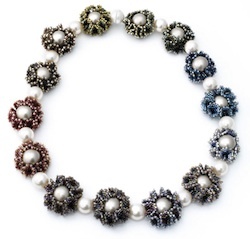 Replace an everyday necklace with this tactile chain stitched with 4 mm pearls and size 8 and 11 seed beads. 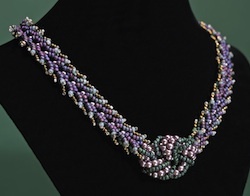 A four-strand double know creates a swirling focal. 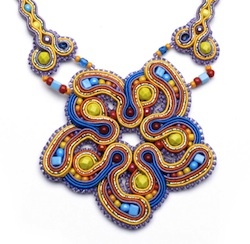 Hibiscus pendant By Amee K. Sweet-McNamara - See what happens when you combine colorful soutache braid with a rainbow of beads. This beautiful pendant give a free-form feel to a well-thought-out design. Include jump rings to attach a pair of simple neck straps or go to www.BeadAndButton.com/freeprojects to download instructions for Amee's soutach straps. Opt art-cuff By Barbara Briggs - Stitch a loomwork (or square stitch) bracelet of abstract shapes. Add a BronzClay toggle ring and disks to finish the piece. 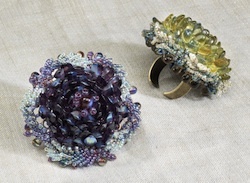 Crazy for chrysanthemums By Virginia Blakelock - Combine stitches for a fabulous embellished chrysanthemum ring. Use a variation on netting to make a honeycomb base, and then fill each cell with an up-turned petal bead. Attach the embellished honeycomb to a filigree ring finding, and surround it with leafy fronds and short fringe for a spectacular ring. 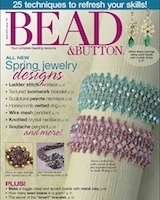 Bead Soup - Get the scoop on just how many seed beads are in a gram, see the Preciosa palettes in action, try out some reader tips, and read up on the newest beads and books on the market! 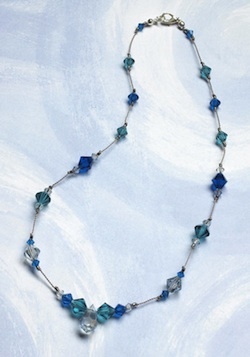 Glistening ocean necklace By Connie Whittaker - Use a variety of crystals to create a delicate necklace using an easy knotting technique. Technique Workshop: Modified Loomwork By Sheilah Cleary - Give your loomwork extra dimension and character by stringing beads on the warp threads, stitching partial rows, and adding a little twist. 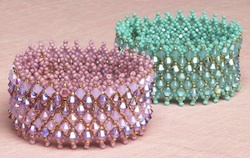 Netted bicones By Heike Weiner - The diamond-shaped openings of a netted bracelet make the perfect home for bicone crystals. 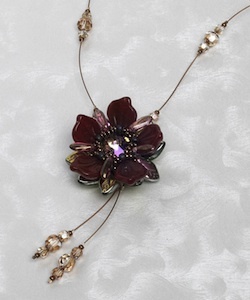 Victorian rose By Isabella Lam - Using bead weaving, stitch a fantastic flower with a variety of beads, and string it at the center of a fast, easy necklace. 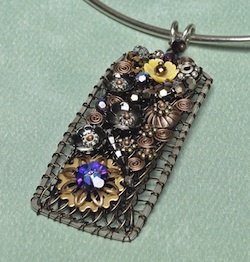 Mesh mosaic By Irina Miech - Capture wire mesh in a frame, and embellish it with beads, spacers, and components to make one-of-a-kind pendant. Artist Profile: Lydia Muell By Ann Dee Allen - After an on-again, off-again pursuit of art, lampworking took Lydia by surprise seven years ago. 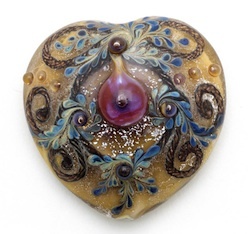 Today, her glass beads are influenced by history, mystery, and a touch of the mystical.